Get the style of flooring you desire at an affordable price with our selection of luxury vinyl tile. LVT is a type of resilient flooring that has an enormous variety of uses, making it a great choice for any room in your home. Let us know what you want your flooring to look like and we provide you with the ideal style of these versatile floors. We offer a number of trusted brands, such as Naturcor, Genua, and Taloga Plus, Rockford, and Cheyenne. No matter what your particular flooring design vision happens to be, our floor specialists can help you find a floor that lives up to your expectations. We have a wide range of styles and colors available so you can perfectly imitate any variety or species of hardwood. Don’t wait any longer to upgrade your home with the addition of a beautiful luxury tile plank floor; get in touch with us today to discuss our expansive selection of flooring options. Right now, anyone can receive $100 off the cost of their luxury vinyl floor tile purchase. Free estimates are available upon request and special financing options make it easy to find the flooring you want while staying within your budget. You won’t find a better deal on LVT flooring anywhere else. Everyone wants premium flooring for their homes. 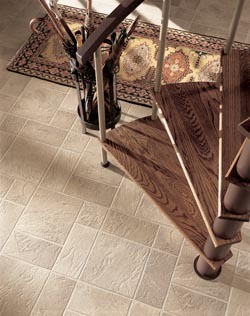 Affordability is one of the most important factors homeowners take into account when looking for a new floor. That is why our luxury vinyl tile is truly an outstanding deal. We have incredibly affordable prices on LVT flooring that is perfect for those with a taste for the finer things. Imagine you could finally have the floors you always wanted for each room in your home. The hallways and dining room feature richly dark wood flooring. The kitchen and bathrooms boast stunning tiling that complements the interior décor. All of this can become a reality with luxury vinyl tile. The manufacturing process that creates LVT flooring allows it to replicate the appearance of many of the most popular high-end flooring materials. Hardwood, ceramic tile, and even stone tile are just a few of the designs that LVT can mimic. You’ll enjoy truly beautiful flooring that matches your expectations in terms of appearance and functionality. Design flexibility is one reason that luxury vinyl tile flooring continues to grow in popularity. Not only do you get to choose a design the looks like the material you want, such as natural stone you can also further customize the individual design. This means you can choose floors that replicate the look of the high-end stone and tile you desire at a fraction of the cost. This level of customization extends to other design options, such LVT which replicates ceramic tile. You can purchase LVT flooring that comes in the exact color and texture of ceramic tile you want. With so many combinations of styles, colors, and textures, the possibilities are endless. Another benefit of luxury vinyl tile is how durable it is. This type can withstand frequent foot traffic on a regular basis and still maintain its appearance. You also do not have to worry about warping or cracking due to moisture exposure. With its combination of style, resiliency, and affordability, it is easy to see why many consider luxury vinyl tile the best value in the entire flooring industry. Hardwood is one of the most popular and visually appealing flooring types available today. Attractive luxury plank flooring mimics the appearance of hardwood complete with grain patterns, whorls, and knots, and available in a number of species options. LVP adds elegance and sophistication to any space throughout your home. Purchase these floors if you want to give your dining room a makeover without completely altering your design scheme. A new vinyl plank floor can effectively transform that space, bringing all of your existing furniture and décor together in a single coherent look. Another area that could benefit from the addition of this flooring is your entryway. When entering your home, this room is the first one anyone sees. First impressions are important, and you can enjoy the comfort of entering your home by stepping on a stylish and durable floor. Entryways tend to see a lot of traffic, which makes vinyl an excellent choice. Thanks to the durable nature of our luxury plank floors, you won’t have to worry about continual care and maintenance. Your floors will maintain their beautiful hardwood appearance for years to come. Upgrade your home or business efficiently and effectively with a luxury vinyl tile installation from our skilled installation crew. Adding an LVT floor to your home increases its value. For homeowners interested in selling their home at some point in the future, a new luxury vinyl floor is an excellent investment. The durable nature of vinyl means you won’t have to worry about your floors losing value in the short-term. With a wide range of contemporary and classic flooring styles available for you to choose from, you can be sure that your floors will remain in style far into the future. Adding a new LVT floor to your home is a great way to reduce your flooring maintenance workload. LVT floors are exceptionally easy to maintain, requiring only basic dusting and sweeping to keep them clear of dirt and dust. Free up some time in your busy schedule with the installation of these convenient floors. In addition, when you purchase an LVT floor from our reputable store, you can realize your complete home design vision. The addition of a new floor is often the perfect way to transform the appearance of an outdated or unappealing interior space. Our flooring specialists will make certain that your new floor matches your design dreams. Contact us if you need LVT flooring. We serve our customers in Greer, Greenville, Spartanburg, Easley, and Anderson, South Carolina.